Barrel racing pairs horse and rider in a race against the clock. Three barrels are set up in a cloverleaf pattern in the arena, and the rider must cleanly negotiate the pattern. 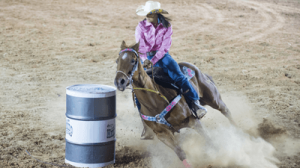 The distance between the barrels differs by organization, but averages distance are: 9 feet between barrels 1 and 2, 105 feet between barrels 1 and 3 and barrel 2 and 3, and 6 feet between the start line and barrels 1 and 2. The rider enters the arena at a gallop and runs toward the first barrel. A rider can choose between starting at the left-most or right-most barrel and turns a complete circle around the barrel. The rider then steers her horse toward barrel 2, circles is, and charges toward barrel 3. After rounding barrel 3, the rider pushes her horse toward the finish line at top speed.